1. Where/when did you both acquire your love for type and the lost art of letter writing? 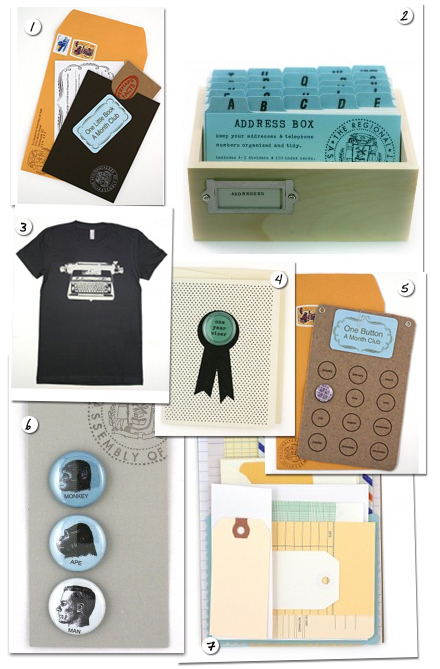 We have both been letter writers and lovers of type our whole lives…from our first pen pals to our most recent letterpress project. 2. You're both Emily Carr grads, what was it that made you want to start creating? Do you feel like you were born with a desire to create or did something trigger it? From a very young age, we were both always busy with our hands. Rebecca was put to work as soon as she could hold a pencil to draw elaborate family portraits, including all 25 cousins. Brandy was an only child and had to build her siblings out of paper and glue. It just seemed natural that art school should follow. 2. I read that one day one of you called the other with the idea to open up a shop. What compelled you to go into retail back in 2005? We both have always loved creating things and the fact is, you can only make so many things before they will no longer fit in your apartment. We started selling our wares at craft fairs and they were well received, so opening a store seemed logical. 3. Can you talk about how you came up with the shop's concept and was it your original concept prior to opening the shop or was it something that organically evolved because of the location/neighborhood/target market? From the beginning we knew we needed a concept that was broad and flexible enough to include anything we might want to make. Being that we both had backgrounds in book making and printing, a text theme seemed like a natural choice. 4. Name one thing that completely took you by surprise when you first started The Regional Assembly of Text - something that neither biz how-to books or any small biz workshop prepared you for. We had written an extensive business plan that included back-up plans if our dream of making and selling our own wares didn’t work out. These plans included things like hosting various workshops, custom screen printing, and getting other jobs. Having a well thought out back-up plan made us feel prepared for anything, but we were really surprised and thankful that from the very beginning we were able to focus on our original concept. 5. I love the name "The Regional Assembly of Text" - can you share 3 other names that were close runner ups or ones that would have been disastrous in hindsight? 6. How long did it take you to set up the shop? Start from the day you said to yourself I'm opening a shop to the day your doors opened. What was the easiest/hardest? From the moment we first talked about it to the day we opened was a year and a half. The easiest part about starting The Regional Assembly of Text was choosing a business partner, and the hardest part was deciding on a name and designing a logo. 7. The Regional Assembly of Text has received a good amount of press coverage since you opened. Do you have any marketing and promotion tips for aspiring and shop owners? We have been so lucky with the amount of press that we have received. When we first opened we sent out press packages which were received with little to no enthusiasm. Having a monthly Letter Writing Club has attracted a lot of attention from the press, which was our original intent. It is also one of our favorite days of the month. Our advice is to have an original idea that captures peoples interest and gives them something new to write about. 8. Some say that the best business partners complement each other's strengths and weaknesses. Can you illustrate this balance using 3 points. Rebecca: Does not enjoy talking on the telephone. 10. You've been in business since 2005 - was there a year where you felt some kind of sigh of relief and felt confident that you weren't going to be part of a statistic? They say that in the restaurant business, you shouldn't expect to see any profit until your second year - is it the same for retail in your experience? After our first Christmas, December of 2005, we felt a collective sigh of relief. Partly because we were exhausted and partly because we knew our rent was paid for the next year. Thank goodness for Christmas. 11. I know that you make most of what you sell, but do most of the other designers you carry approach you, or do you actively seek out new designers/crafters? If so, where? What is your process in choosing merchandise and what 3 things can artists do to stand out in your mind? We are very different from most retail stores because we do make most of the products that we sell and we like to keep it this way. This is an advantage to us because, not only is everything unique to our store, but also because we have a higher profit margin on products made in-house. On the rare occasion we decide to carry products by another designer it is because one…their aesthetic is similar to ours…two…their products are clean and well presented…three… they well organized and their work is consistent. Advice for designers/crafters is to understand that shop owners are busy people and approaching them in person can be inappropriate and unprofessional. 12. If Oprah decided to give you $10,000 tax free for your business, but you had to spend it in one week, what would you do with it? Rebecca would close up shop and do the huge renovation we couldn’t afford to do when we opened…new floors, new ceilings and new hair do’s. Brandy would spend her week finding the perfect studio space and pay a years rent all at once. (She hopes Oprah would be okay with that). 13. You were both part of the Hell Passport Project. Can you share some of your favorite pages from volumes 5 & 8.